Photo above: Judge Hassan Ali El-Amin testifies. Most Americans cannot be forced to retire, but in Maryland, judges must give up full-time work when they hit 70. Senate President Mike Miller, now 72 himself, led a panel of Maryland judges telling the Senate Judicial Proceeding Committee Tuesday they want to change that and add five years to when fellow judicial baby boomers should be forced into retirement. “We have men and women who are doing a wonderful job on the bench and the problem is we are losing them at a young age…the judges that I find to do the finest jobs are 70 and older,” said Robert Zarbin, past president of the Maryland Association for Justice, a trial lawyers group. 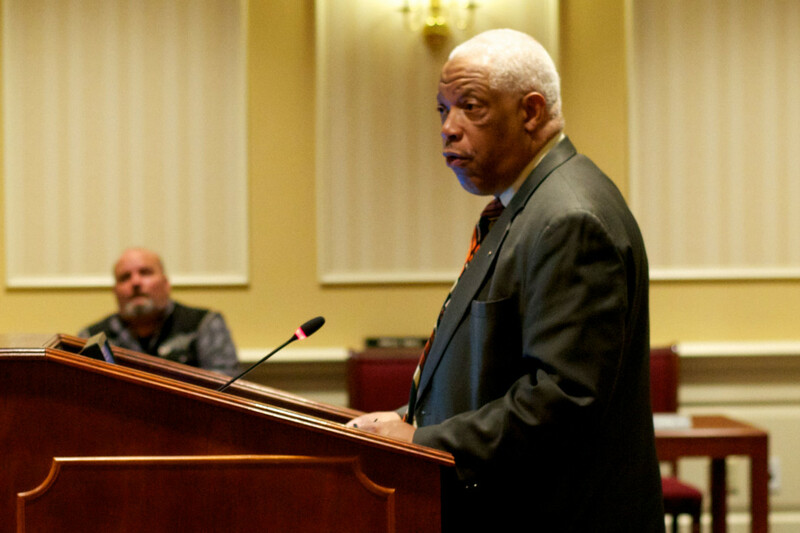 SB 847 would amend the Maryland constitution, raising the age limit to 75-years old, assuming judges have not yet finished their 15-year terms. “So much has changed in recent years as life expectancy has increased significantly,” said Miller. He believes the 70-year age cap to be outdated; it was enacted in 1940 when the life expectancy was 63.5-years old. Thurman Rhodes, a district court judge for 26 years, testifying on his own behalf before the committee, believes the state would save money. Rhodes, as well as fellow judges, serve past the average retirement age of 60 because of love for the job, receiving no increased compensation for seniority. Judge Richard Collins, a Maryland District Court Judge since 2008, seconded Rhodes opinion, saying the state of Maryland is “wasting money” by paying retirement pensions to judges who still want to serve. The Department of Legislative Services reports that upping the age to 75 would cause state pension contributions to “decrease by $2.1 million in FY 2019,” due to the deferred judicial retirements, with increasing savings in future years. The judges believe the bill would encourage appointing judges who have “a little age on them,” saying that with age comes experience and knowledge. “I know several judges whose services will soon come to a mandatory end, which I would consider unnecessarily premature,” said Circuit Court Judge Hassan Ali El-Amin, Prince George’s County, testifying his personal views before the committee. Judge El-Amin suggested voters will not elect a judge that has the age cap on his career looming in the near future. El-Amin argued that “the recent trend of appointing young judges might be countered,” to elect judges who have “gained more experience, wisdom and perspective,” and remain physically and mentally healthy. A trial lawyer from Baltimore, who has had a few bad experiences with aging judges, questioned the bill. “I’ve had older judges fall asleep on the bench at trials…us baby boomers have to give it up at sometime,” said Daniel Clements, 67. “Not all of us are as fortunate to regularly drink from the fountain of youth as Senator Miller, who maintains his youth and his vigor…I believe that you make room for the young,” said Clements. Clements pointed out that Senate President Miller was elected at the young age of 29, claiming that selecting older officials “stifles young people,” who are waiting for judicial positions to open up. “There’s no lack of people,” said Clements, recalling how 20 to 30 lawyers applied for a recent judicial vacancy in Baltimore City. Committee Vice Chair Lisa Gladden, D-Baltimore City, does not believe the five year jump would create any large effect. Currently, retired judges in Maryland are allowed to ‘sit-in’ for vacant judges. This provision allows judges who have reached age 70, and have mandatorily retired, to continue to serve and collect their pensions as well. They can earn no more than the salary of sitting judges. “I don’t understand how it makes a difference,” said Gladden. After 16 years of service a judge can retire with two-thirds of a judge’s salary. Retirees with fewer than 16-years of service in the Judicial Retirement System (JRS) receive a prorated benefit based on their years of service. This year a circuit court judge makes $149,600 annually, according to the Judicial Compensation Report. If the bill passes, the amendment would have to be approved by voters at the 2016 general election.